Togod Omer Adam of Sudan and Takalit Rishahi from Eritrea became the first African refugees admitted to the Histadrut Labor Federation as full members, after an agreement was reached on Wednesday, June 13, between the organization and representatives of refugees and activists from Hadash. Thirty mainly Sudanese refugees, whose application to join the Histadrut had previously been stonewalled by the labor federation, organized together with Hadash and other pro-refugee activists to force the mega-union to heed its own regulations, according to which anyone working in Israel is entitled to become a member. However, the Histadrut reversed its position before Wednesday’s tribunal hearing. Making a distinction between the type of permit that includes no prohibition or restriction regarding work, as opposed to some of the permits given to refugees, the Histadrut announced: “After a reexamination regarding the temporary permits, it turns out that, at present, employment of some of the holders of the permit is permitted,” The Labor Federation promised to accept holders of such unrestrictive permits as members. Communist attorney Mor Stoler, a lawyer who specializes in labor rights and who is a member of the Hadash leadership in the unions, said the Histadrut’s new stance is “a radical change from its initial claim that these are illegal residents and illegal workers that it refuses to accept. The decision reflects a rejection of the discriminating atmosphere that prevented the organization of the asylum seekers, and is an important step in the direction of trade unions abroad — which are also working to organize refugees.” Stoler added that, in any case, the workers’ legal status is irrelevant to protecting their rights. There are some 35,000 asylum seekers living in Israel, over 90 percent from Sudan and Eritrea, whom Israel cannot expel, most of them workers. 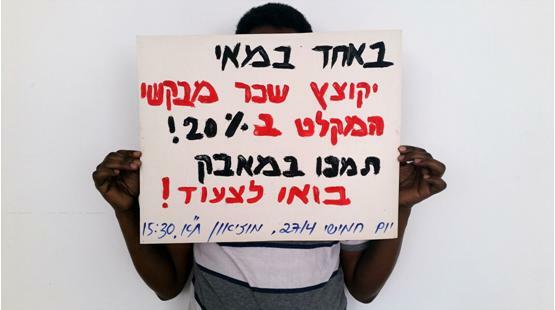 Hadash activists will soon renew recruitment of the asylum seekers to the Histadrut. Togod Omer Adam, the new Histadrut member from Sudan, said that his and his colleagues role was now to explain to people what the Histadrut is and why it is important for working refugees to join. He hopes that the Histadrut will help them fight laws that are harmful to them. “This is good news,” he said to Haaretz.